There are many wonderful Myrtle Beach golf courses and none are more challenging and enjoyable than Glen Dornoch Golf Links. Located in Little River, S.C., just a few minutes from North Myrtle Beach, Glen Dornoch makes you feel as if you have taken a trip back in time to Scotland and playing the old Scottish links. One can almost hear the bagpipes playing in the background. The natural setting of this wonderful course offers spectacular views of the Intracoastal Waterway as the fairways wind through centuries old live oaks and untouched marshlands. Wildlife is abundant on Glen Dornoch, making you feel as if you are playing in a wildlife preserve. Glen Dornoch’s first three holes are fairly easy, giving you a chance to warm up for its very challenging finish. Accuracy off of the tee and positioning are essential on this course. Using your driver certainly is not required, but laying up to the correct position is. It is very easy to get distracted by the beautiful nature that surrounds you. After your round on this outstanding Myrtle Beach golf course you certainly will want to enjoy a meal or beverage on the porch of their beautiful clubhouse. The view is spectacular. 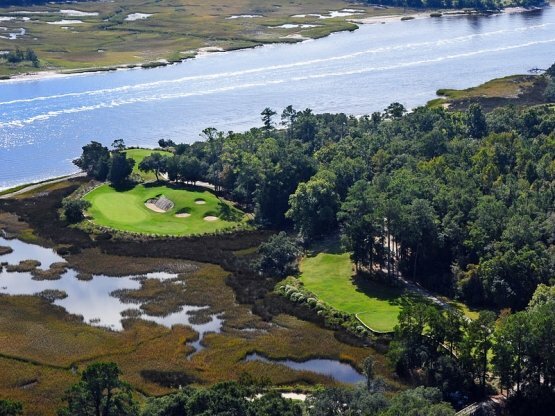 While booking your next Myrtle Beach golf package you certainly want to include Glen Dornoch. It can be matched with any of the other fantastic Myrtle Beach golf courses. The wonderful, warm Myrtle Beach weather and the great North Myrtle Beach condos and hotels are sure to make your Myrtle Beach vacation a memorable one. Don’t forget to check out all of the world class Myrtle Beach shows and Myrtle Beach nightlife. Book your Myrtle Beach golf package today! Great course in great condition, one of the best at the beach. We only had one complaint they would not let our entire group go to the first tee together, this was the only course at the beach that has done that to us. Our Group of 12 golfers played this course on a Saturday, the pace of play was great no waiting. The staff were very friendly. The course was in great shape tee to greens. The finishing holes were fantastic, the best we have seen in Myrtle, and we have played all the best rated courses. I would highly recommend this course to anyone, it is a must play for any golf trip to Myrtle Beach. The views of the Waterway on 16,17 and 18 are something special. My assistant Karen and I played Glen Dornoch with our husbands and had a great time. Twice we had deer scurry across the fairways right in front of us. One of the most scenic courses on the Grand Strand, although it did eat a few of my balls. Would recommend this course to anyone just make sure you take your "A Game" as it has some tricky holes.